Peterborough signed 18 new players over the summer. It's only Ryan Tafazolli and Joe Ward from last season's squad who could play against Pompey. They sold Jack Marriott to Derby and Leo De Silva Lopez to Wigan for £1m. Once Steve Evans arrived as manager it was always on the cards that he would use the summer to get his own players in. The ones that were at the Posh towards the end of last season just didn't suit the way he played at all. It's been remarkable because everyone expected them to start slowly as the players all gelled together, hopefully be in touch and then kick on during the second half of the season. The start has confound a lot of people, including Evans. The manager only gave them a B rating for their performances so far. The results have been better than the performances. What they have got is a strong, physical back five. It's the biggest I can ever remember – the goalkeeper is 6ft 7inch tall. Peterborough have been hard to break down, albeit only keeping one clean sheet. But the Posh have been very potent at the other end. In most games, they've had less possession than the opposition but have been ruthless on the break and scoring when they get the chances. Jason Cummings is better than League One, having arrived on loan from Nottingham Forest. He's developed a partnership very quickly with Mark Godden. They wouldn't have known each other before arriving at London Road. They're both quick and mobile, and have linked up very well. It's the same with Siriki Dembele – he's been a revelation. 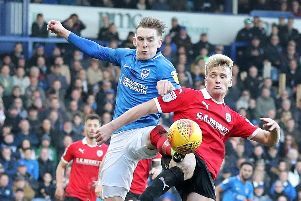 Peterborough were totally reliant on Jack Marriot for his goals and Marcus Maddison setting most of them up last season. If it wasn't for those two then they probably wouldn't have finished in the top half. Maddison must have a chance of starting against Pompey – he must be close. He's not been starting because Peterborough expected to sell him in the summer and it never happened. I think he got a bit down about it but his attitude has been spot on. If he does play it will be instead of Dembele, but I don't know why Evans would break up the front two. Goals are coming from everywhere and they're more of a team this season. Promotion is the aim. That's why they got Evans in as boss. He's got a decent record and if they finished in the play-offs but weren't promoted then it wouldn't be a total disaster. They are very keen to get back into the Championship.